RB Incuse. Stamped on heel. 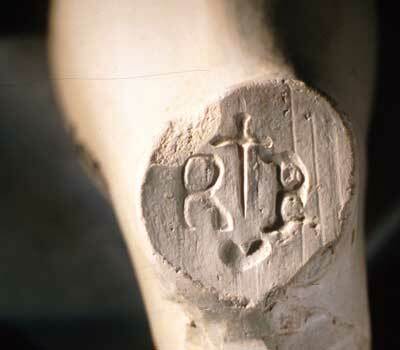 Between the initials is the symbol of a dagger above a heart. Stem bore size: 8/64ths. Both pipe bowl and mark attributed to Bristol pipemaker Richard Berryman 1619-52 (Walker 1977:1408). Crowned rose Relief. Stamped on heel. On either side of the rose are the numbers 1 and 6. Stem bore size: 8/64ths. Pipe bowl of Dutch manufacture dating from 1625-45 (Duco 1981). 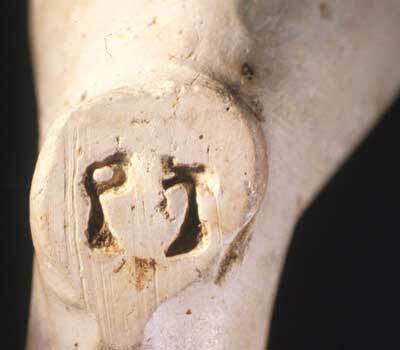 Mark identified as Dutch and dated by Oswald (1969:138) to the first half of the 17th century. EL	Incuse. Stamped on heel. Stem bore size: 8/64ths. 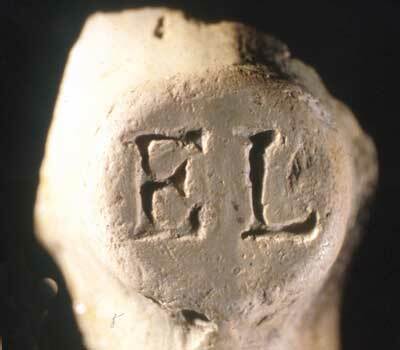 Fragment of stem and heel only, but mark identified as Bristol pipemaker Edward Lewis (1631-40/1) or Elizabeth Lewis (1652) (Walker 1977:1456). TG	Incuse. Stamped on heel.Stem bore size: 7/64ths. Incomplete and finely burnished pipe bowl, its form appears similar to Wiltshire or Bristol pipes from the first half of the 17th century. 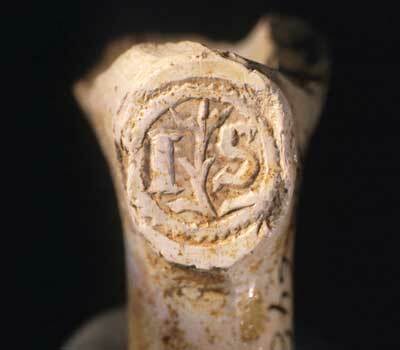 Possible maker: Thomas Grigg, Bristol pipemaker apprenticed in 1630/1 (Walker 1977:1155). Thistle/Tulip Relief. Stamped on heel with circular pearled bordering. Stem bore size: 7/64ths. 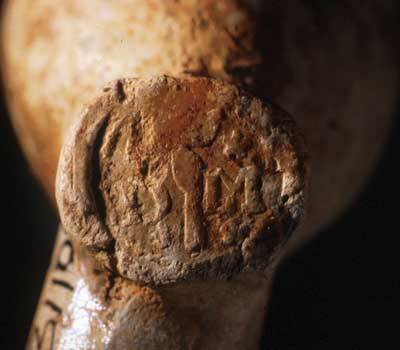 Pipe fragment consists mostly of stem and heel, but origin very likely Dutch. 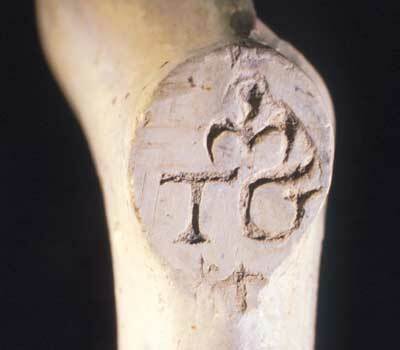 John H. McCashion identifies similar mark as a Dutch thistle (1635-45). Duco (1981) gives several examples called tulip and leaves (1655-70). 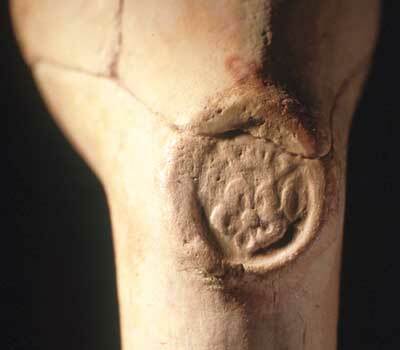 Oswald (1969:141) dates this Dutch mark from 1630-70. DM? Relief. Stamped on heel. Mark partially worn but appears to be the crowned initials DM with stars on the sides and a pipe in the middle of the initials. Stem bore size: 7/64ths. 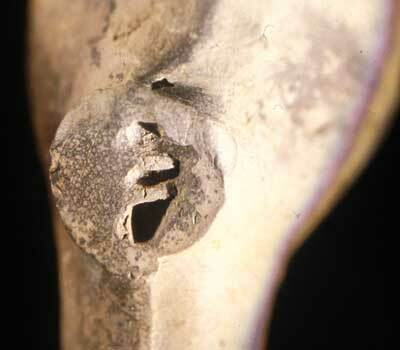 Fragmentary pipe bowl is of Dutch origin dating between 1625-45 (Duco 1981:454). Maker may be Daniel Mourisz from Gouda (1669); or Dirck Anderies Mine (1661) from Leiden. Refer to Duco 1981. PT	Incuse. Stamped on heel. Stem bore size: 8/64ths. Pipe bowl similar to Barnstaple pipes dated 1630-60. May be Barnstaple pipemaker Peter Takell (d. 1637). Refer to Grant and Jemmett 1985:473. Oak Leaf/W	Incuse. Stamped on heel. 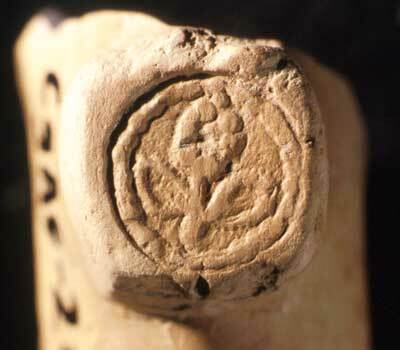 Mark looks like a W but is also referred to as an incuse bar shape or an oak leaf. Stem bore size: 7/64ths. Pipe bowl manufactured in the West Country of England, possibly Barnstaple or Plymouth and dated from 1620-50. See Grant and Jemmett 1985:506; Oswald 1969:129. Similar mark identified by Oswald in Noel Hume as an oak leaf (1979:30). Tudor Rose	Relief. Stamped on heel. Stem bore size: 6/64ths. 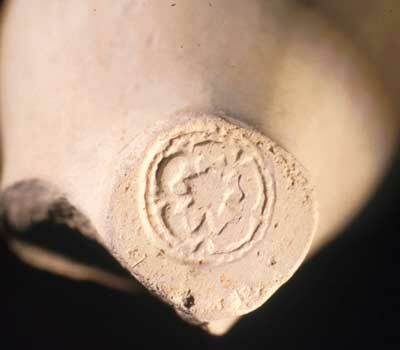 Pipe bowl and mark identified by Oswald (1969:139) as Dutch manufacture. 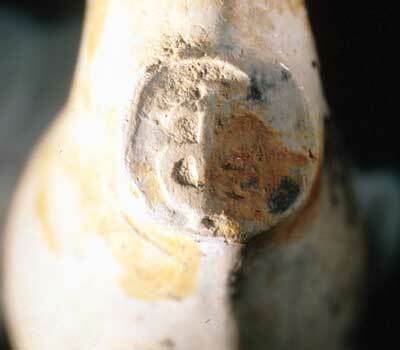 Mark dated by Atkinson and Oswald (1972:182) to 1615-40; Duco 1981:257 dates mark from 1630-45. IS	Relief. Stamped on heel. Stylized tobacco plant between initials. Stem bore size: 7/64ths. Bowl shape London style dated 1640-60. Refer to Walker 1977:1529; Oswald 1975:37. Possible makers: John Smith (1634); John Stevens (1644).